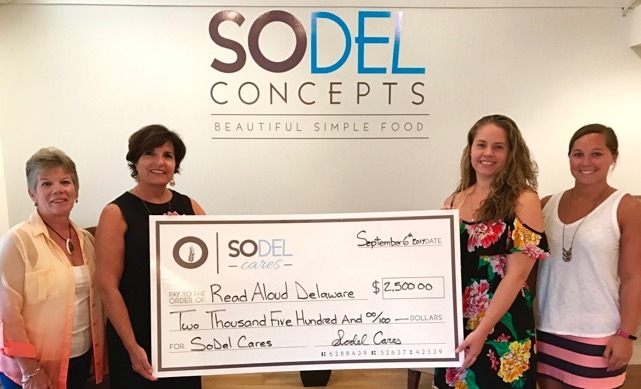 SoDel Cares, a nonprofit foundation, recently donated $2,500 to Read Aloud Delaware. SoDel Cares donated $2,500 to Read Aloud Delaware, which secured matching funds. Shown are (l-r) Paula Kotowski, Read Aloud volunteer; Lisa Coldiron, Read Aloud Delaware Sussex County coordinator; Lindsey Barry, comptroller for SoDel Concepts, which founded SoDel Cares; and Caroline Judge, social media specialist for SoDel Concepts. "Reading is so important when it comes to early childhood education," said Scott Kammerer, president of SoDel Concepts, which started SoDel Cares in 2015 to benefit residents, particularly children, in the community. "Read Aloud helps children develop that love of reading," Kammerer said. "The organization also encourages parents to read to their children so that the kids are better prepared to succeed in school and in life." SoDel Cares asked Read Aloud to find donors who would match the $2,500. We received matches from the Village Improvement Association and from a fundraiser. SoDel Cares will hold its third annual fundraiser Friday, Nov. 17, at Fish On in Lewes. The evening will feature silent and live auctions. A $25 donation is suggested. For information, see SoDel Concepts' event calendar at www.sodelconcepts.com.